It’s good to see how many people appreciate the first tip we published from Dean Roscoe’s Wilcom embroidery lettering tips. If you missed it, see Tip 1: Update Kerning Values. 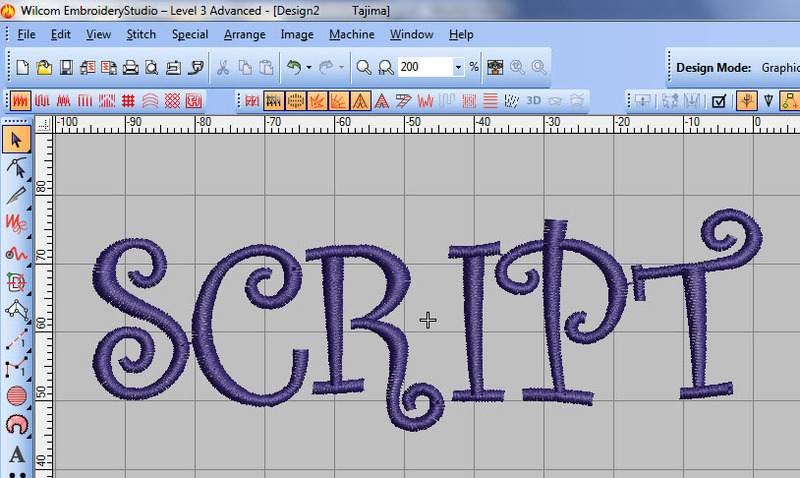 Stock embroidery fonts have a recommended minimum and maximum height. Once you step outside of these guidelines the stitch quality will start to suffer. The example below (Figure 3.) shows a tight curl at the base of the letter ‘R’, which will puncture a hole in the fabric if the word is stitched too small. The solution is to trim off the end of the curl (Figure 4.). However, this would be a chore if the process had to be repeated every time the same letter was typed. Wilcom has another great feature called ‘User-Refined Letter’, which saves your modified version (Figure 5). Furthermore, it allows you to specify a letter height beyond which the original letter will be substituted for the modified version automatically. stay tuned for Tip 3! This was a GREAT article! Thank you Dean. I learned a lot and it is useful material to learn! I have one question, and I Really hope that you can answer it. Hello? Hello? Anyone there? I am still here hoping for an answer to the question above, posted Nov. 14th. The minimum and maximum height for our alphabets are documented in our onscreen manual. The onscreen manual can be accessed from the Windows start menu under Wilcom EmbroideryStudio e2 –> Documentation. Thank you Very much! Sometimes, I can search and just never find what it is I am looking for….thank you for this helping hand! I loved your Tip #2 also. 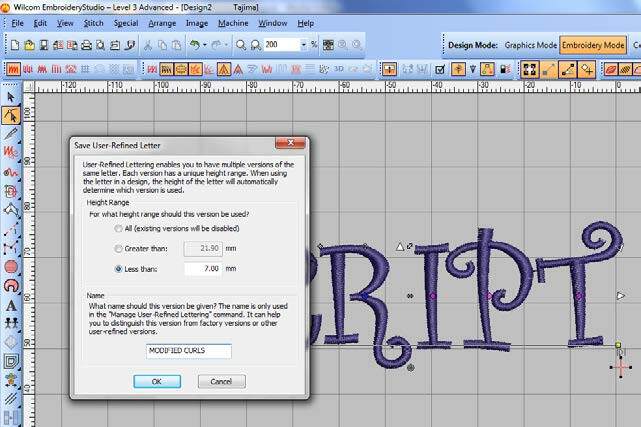 The user-refined changes are saved in Wilcom lettering font esa file in WLETTER folder. For instance, if you did user-refined change for a letter in Block2 font, the change is saved in Block2.esa in WLETTER folder. Therefore, please back up esa files in WLETTER folder before updating from e1.5 to e2.0. after e2.0 installed. After updating is done, copy and paste those esa files into WLETTER folder of e2.0. P.S. this question would also apply to the saved kerning values too, I guess? Thanks Kristi. This is good feedback that we’ll take on board. Hi Kristi, sorry yes, the kerning values are also saved in the esa file as well.